Last week was me and the bf's 5 year anniversary, so we decided to use the LivingSocial deal I bought a few months ago for Co Co Sala. It's located in Penn Quarter with metered street parking, hourly garages and metro access. The closest metro stop is Metro Center, which connects the red, orange, and blue lines. There are some tables outside for eating during warmer weather. The 1st thing I would say about the interior is that it's DARK in there. My camera was on an indoor setting, otherwise you wouldn't be able to see anything. The 1st room we were in (left) was so cold because of a vent, so we asked to move. It seemed to be a hassle to move us (not sure why, it wasn't that crowded), but eventually we were moved into another room which looked like it seated 3+ person parties (right). The original room we were in was very cramped as it mostly sat tables of 2. We were literally a foot away from the next table. This was the room we ended up staying in, and there was so much more room and light. The decor is really beautiful and modern. 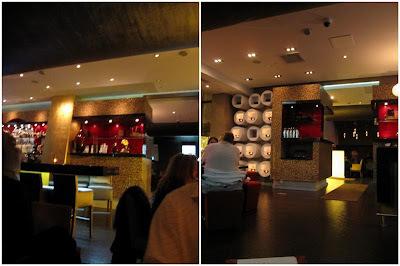 It looks like a lounge/club. 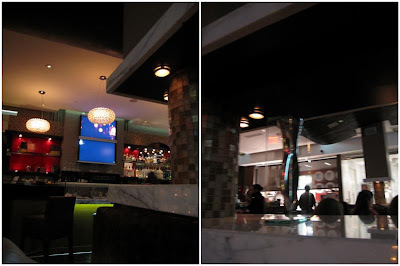 The picture on the left is of the bar, and the picture on the right is of the kitchen. As I was walking to the bathroom, I saw there's another room behind where we were sitting that seemed to have even larger tables for bigger groups. After finally getting our menus (they forgot for a while), I decided I needed a drink. Our server said this was their most popular drink, 'Cocojito- chocolate vodka, lime, mint, dark chocolate shavings' for $13. It tasted like a regular mojito, with a slight hint of chocolate. This is a tapas-style restaurant, so the portions are very small. For dinner we ordered 2 types of mac & cheese. 'Bacon Mac & Cheese- Orechiette, four cheeses, crispy bacon' for $7 (left). The strip on top is chocolate covered bacon. 'Shrimp Mac & Cheese- mini penne, jack & cheddar, garlic shrimp, jalapenos' for $7 (right). They were both amazing and so flavorful! I enjoyed both but preferred the shrimp one, and the bf preferred the bacon one. The bf wanted to try the 'Tandoori Chicken Slider- cardamom carrots & greens' for $7 (left). I thought it was really good and flavorful as well. We also ordered the 'Italian Cheese Course- parmigiano reggiano three ways, fig & pesto toast' for $10 (right). This included a foam with a cheese crisp, chunks of cheese, and slices of cheese on top of the fig & pesto toast. I ate all of the foam because the bf thought it tasted like foie gras. The combination of cheese, fig and pesto was really delicious. 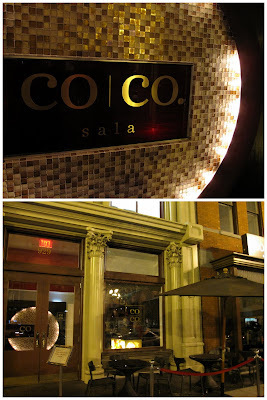 The main attraction at Co Co Sala are its chocolate desserts. We decided to go with the 'Xocolatyl- Aztec expirence' for $22. 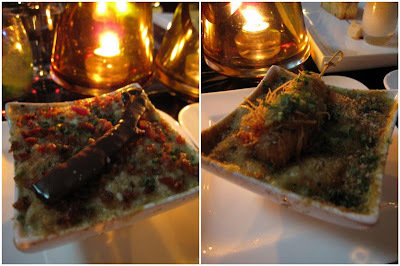 This is a three course tasting with an amuse bouche, main dessert and petit fours. 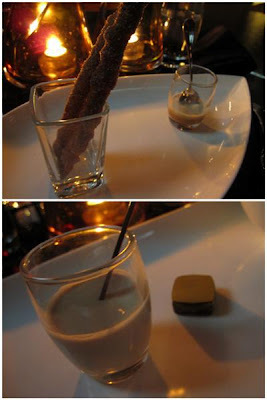 The amuse was 'churros, cinnamon cream, dulce de leche dip' (top). The churros were really nice and warm and the cinnamon gave the cream a nice surprising flavor. Then the main desert came out with 4 different items 'hot chocolate soufflé with fiery chocolate center, espresso gelato, chipotle truffle, kahlua soother'. The kahlua soother and chipotle truffle were interesting(bottom) because the chiptole gave the chocolate a hot sensation, and the kahlua cooling. Next was the 'espresso gelato and chocolate soufflé with fiery chocolate center'. Gelato is always so good and smooth in texture. The chocolate souffle was really interesting as they used jalepenos to make it spicy. 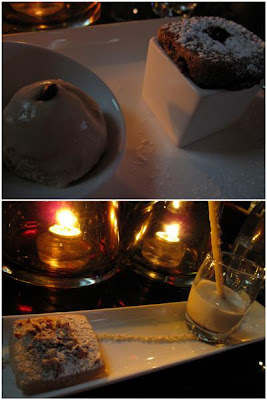 The petit fours was a 'chocolate infused horchata and mexican wedding cookie'. The horchata was a rice drink with sesame in it. The mexican wedding cookie was almond flavored, which was delicious. Us on the metro on our way to dinner. Why does he always make faces in pics? Overall I had an ok time at dinner. This is definitely a place for those that like chocolate, enjoy trying new flavor combinations, tasting a lot of different dishes and hanging out with friends. I enjoy places like this, where as my bf would be happy with traditional American food in large portions. 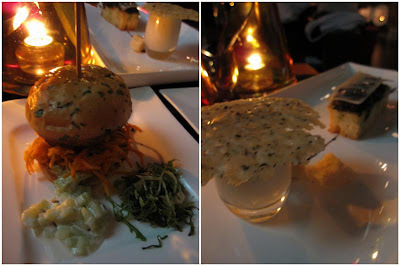 The entrees were very flavorful, and the desserts were light and not too rich. The service however was a little "all over the place." I was expecting better after reading all of the great reviews. You should also be prepared to pay a lot of $$ if you're hungry. Mon-Wed. 10:00 a.m. - 12:00 a.m.
Thu. 10:00 a.m. - 2:00 a.m.
Fri. 10:00 a.m. - 3:00 a.m. Sat. 5:00 p.m. - 3:00 a.m. I just wanted to reach out to you personally. My name is Bharet and I am the owner of Co Co. Sala. I get all the alerts regarding Co Co. Sala...keeps me on my toes. I certainly appreciate you taking the time to write such a thoughtful and diligent review. I appreciate the support and will hopefully keep working hard to make sure we try and become one of your regular spots. Not sure if you have had the opportunity to try lunch or brunch but I highly encourage it. Thanks so much and I hope to meet you and your boyfriend next time you are at Co Co. Sala and it would be a pleasure to have a drink with both of you.